The setting is of an excerpt from the journal of Maria Mitchell (1818-1889), who was an important American astronomer and one of the original faculty members of Vassar College. Written for soprano Jamie Jordan. Commissioned by Mark Scatterday and the Eastman Wind Enemble in consort with nine other American wind ensembles, this work sets four of the "month" poems of the 14th-century Italian poet Folgore da San Gimignano, in English translations by Dante Gabriel Rossetti and John Thow. "December" is dedicated to John Thow, in memoriam, and the set was written for the voice of soprano Tony Arnold. Commissioned by The Commission Project, the work was composed in celeration of the 150th anniversary of the founding of the Rochester Institute of Technology. Commissioned by The Commission Project, this work is a setting of 20 poems written by young writers whose work was collected and published in Sandy Lyne's "Ten-Second Rainshowers." Composed for the duo of Bonita Boyd, flute, and Nicholas Goluses, guitar, the music is recorded by soprano Kathryn Lewek with this duo on an Albany Records disc. The text is a set of five excerpts from the poetical novel "Persephone" by Homero Aridjis: 1. The Night Opens Out, 2. The Musicians, 3. Persephone Drinks, 4. The Musicians Stop Playing, and 5. Love. "Liptak’s Songs for Persephone open with nervous energy and conclude with touching melancholy. In between, there are some memorable and enchanting moments, like the combination of flute and voice in the third song, ‘Persephone Drinks’, and the harp-like sound of Goluses’s guitar on the last song, ‘Love’. Lewek’s contribution recalls a different character from Greek mythology, the sound of a siren. Whether harmonizing or in unison with Boyd’s delicious flute, the combination is nectar for the ears." The music was written for baritone William Sharp and violinist Catherine Tait, who have recorded the work on Albany Records. The texts are poems by Linda Pastan and Rita Dove, and the five songs of the set are 1. The Bookstall (L.P.), 2. Canary (R.D. ), 3. Crocuses (L.P.), 4. In the Museum (R.D. ), and 5. Under the Resurrection Palm (L.P.). 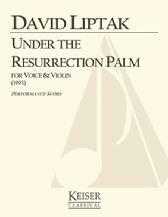 "The selections from David Liptak's Under the Resurrection Palm (1993) were notable for their lovely pairing of violin and baritone, particularly in the supple setting of Linda Pastan's poem The Bookstall about an avid reader dreaming of inked paths opening into the future." The first four of these five settings use old texts from the oral tradition, and the fifth is a setting of the American poet James Wright. They are 1. The Stars (Passamaquoddy Indian), 2. Aiken Drum (Traditional Nursery Rhyme), 3. Ghosts & Shadows (Gabon Pygmy), 4. Death Song (Papago Indian), and 5. The Wreckage of the Moon (James Wright). The music was written for baritone William Sharp, who premiered the work with the 20th-Century Consort, conducted by Christopher Kendall. The recording is by William Sharp and the Dinosaur Annex Ensemble on Bridge Records. "Liptak's colorful use of instrumental timbres and spare, translucent orchestration generally enhanced the somber moods of the poetry. The last two pieces, with texts confronting the hollow spectre of death, were hauntingly moving." "...baritone William Sharp was most effective in David Liptak's richly atmospheric Ancient Songs." "Baritone William Sharp negotiated the chromatic convolutions of the Liptak handily and brought a vast palette of vocal color to its various shadings of night music from mysticism to menace to madness." Written for baritone William Sharp, the music is a setting of poems by James Wright. They are: 1. The Jewel, 2. Twilights, 3. Beginning, 4. Two Hangovers: Number One, and Number Two (I Try to Waken and Greet the World Once More, 5. Milkweed, 6. Spring Images, and 7. A Dream of Burial. Recorded on Gasparo Records by William Sharp with pianist Anton Nel.